Following a frustrating few months, outstanding Team GB star Iain Weaver finally makes his most welcome professional debut at York Hall in Bethnal Green on Saturday 27th April, on the Dave Murphy promoted ‘Thunder & Lightning’ event, headlined by Dean ‘Irish Lightning’ Byrne versus Jay ‘IOW Assassin’ Morris International Masters Welterweight title clash. Weaver, who was an integral part of the Team GB podium squad throughout Rob McCracken’s preparations for the London 2012 Olympics, has enjoyed a highly successful amateur career, culminating in both Commonwealth Boxing Championships Gold and European Silver Medals. Even though he had been enjoying excellent form, in the pre Olympics build up, Weaver unfortunately wasn’t selected for a London 2012 slot, losing out to eventual Gold medalist Luke Campbell. Following a full on sparring session at the TRAD TKO Boxing Gym in Canning Town, Weaver spoke briefly about his upcoming professional debut. 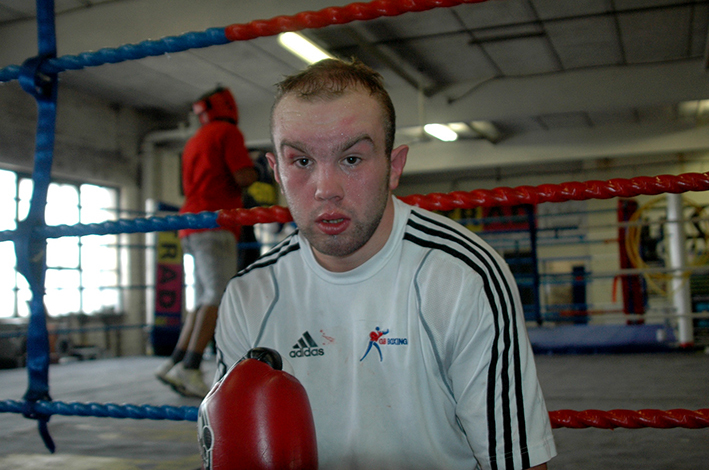 “Yeah, my pro debut is on the 27th April at York Hall. It’s gonna be great night for me and my fans. It’s been a longtime coming, I’ve been waiting nearly a year. I’m just gonna get out there and enjoy every minute. On the 27th I’m gonna make a real statement. It’s been a long time coming, but I’ve been training hard and I can’t wait, I’m so ready to fight. I had a very good amateur career, I was in the Team GB squad four and half years, won the European Silver medal and the Commonwealth Boxing Championships Gold medal, so had a good amateur career. I thought I should have gone to the Olympic Games, I didn’t, which is a bit of a sore subject, but can’t moan had a good amateur career and fought at the European Championships and Commonwealth Games. I fought all over the World, been to more countries than I can remember, which is something I’m hoping to do as a pro. I didn’t get an Olympic medal as an amateur, so now I want to put that behind me and see what I can achieve as a pro, as I really want to win a World title, I want to win as many titles as I can. Finally I’d like to say to all my fans, as well as all boxing fans, it’s gonna be a great night of boxing. I’ve waited a long time for this and I’m gonna put on a great show for the fans. Iain Weaver will be making his debut, against a yet to be named opponent, on the undercard of the Dean ‘Irish Lightning’ Byrne versusJay ‘IOW Assassin’ MorrisInternational Masters Welterweight Championshipclash that headlines Dave Murphy’s Thunderdrome Promotions ‘Thunder & Lightning’ event at York Hall, Bethnal Green in London on the 27th April 2013.